I didn't set out to be a teacher and I certainly didn't think I was going to be spending all day every day with 100+ pre-teens. But here I am and I can't imagine being anywhere else. My very first year I was 21 years old and monitoring the lunch room full of 12, 13 and 14 year olds. I was sipping my tea and walking the aisles when all of a sudden I watched a 7th grade boy stand up, look around and then CHUNK an orange across the lunch room. It hit a girl square in the eye and chaos ensued. I pulled said 7th grader out into the hall and asked him WHY he threw the orange. His response.... "I don't know". I prompted a bit, "were you trying to be funny? Impress a girl? Was it a dare? Did someone pay you to do it???" and again, he responded with, "I don't know". It was in that moment that I realized that middle schoolers are a unique and impulsive bunch and that I was in for a fun ride. Middle Schoolers will say (pretty much) whatever is on their mind, typically it's in the middle of a lesson you're teaching, and very rarely do they think through what they're saying. "Mrs. McAnally, if your baby is growing in your stomach isn't it being eaten by your stomach acid???" Me: "I assure you I am NOT middle aged." When I was wearing a turquoise maxi dress and had my hair down and wavy... "Mrs. McAnally, you look JUST like a mermaid!!!" Student: "I mean... math isn't going to be that important for me to know. I'm JUST going to be a teacher." Student: "My cheek is bleeding"
Student: "What should I do about it? Me: "What do you think you should do about it?" Student: "I'll sit down now"
Me after doing a FULL class period of test review: "Any questions???" Student: "Do you think I'd look better as a brunette???" Me: "And f(x) = x is also called the parent, or mother function"
Student: "Mrs. McAnally!!! You look JUST like The Hulk today!!!" Student: "The Hulk! You know... the green and the purple???" Me: "Um... I do NOT look like the Hulk"
I looked just like the hulk. Me: "What do you mean you don't know who Chris Farley is???.... the SNL skit? Black Sheep? Tommy Boy??? Middle Schooler: I think I've heard my dad talk about him. Student: "I don't understand this word problem"
Me: "Well, let's look at it and figure out what it's asking"
Student: "No... I don't understand what film is"
Me: "Am I being Punk'd???" Me: "You know... that show with Ashton Kutcher where they played jokes on people???" Student: "Is he that guy from Shark Tank?" Middle Schoolers are also some of the most thoughtful and genuine people I've ever met. If I'm absent because me or one of my kids are sick I can guarantee you I'll have emails from students checking on them. If I seem "off" they're the first to notice and ask what's wrong (sometimes it's not the most tactful way of asking... "you look TIRED!!! are you okay???" hahaha) and they notice things like my favorite snacks and will think to bring me some! Sweetest!!! I've had students save their OWN money to buy me a gift card for Christmas to a store that they know I like and have had some of the kindest words spoken to me through notes written by students. When someone asks me what grade I teach and I respond with Middle School I typically get a response like, "Oh my! 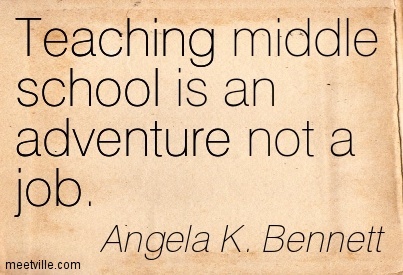 There's a special place in Heaven for middle school teachers!" or "I don't know HOW you spend all day with middle school kids!" 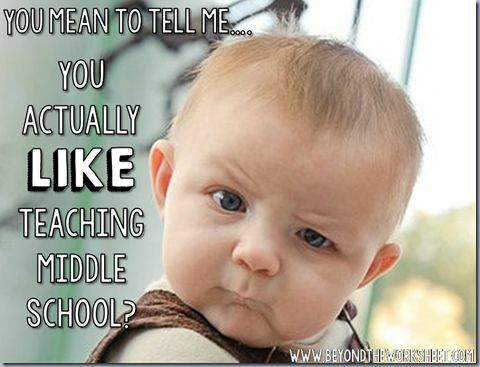 ;) The truth is, that's exactly how I feel about elementary and high school teachers! I think it just goes to show that there's a niche for everyone. So, teachers... have you found your niche? And what's a funny thing that a student has said to you or that you've found yourself saying to them? Oh! And if you have a minute, check out THIS article! It's soooo funny and soooo true!!! Oh my goodness, you always have THE BEST middle school stories! The hulk story cracked me up! And so did that first ecard ;)! This was my favorite age - we had so much fun in class! Some of my favorite memories of teaching are of my middle school band. Have a great day! Such a fun age to teach! 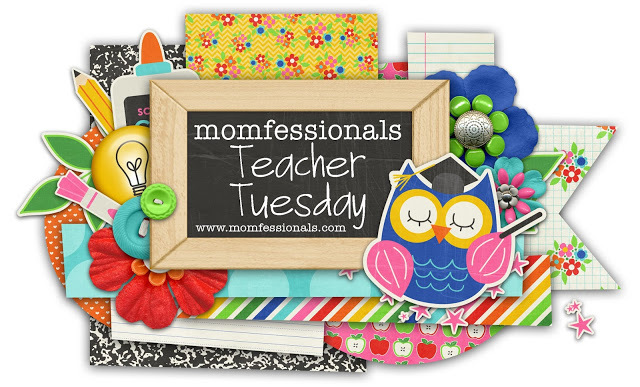 Thank God for teachers like you who love their jobs and are so good at what they do! I have taught Elementary school for seven years now. (Upper elementary) I like you think Primary teachers have a special heart that I don't possess in order to teach little ones. I also work in a very urban setting so I've heard a lot of interesting things! What a sweet post. You are exactly where you need to be!!!! When I worked with the preschoolers with special needs, everybody was always so impressed, but there wasn't anywhere else I wanted to be. Those kids will remember you for the rest of their lives. I taught high school and LOVED it!! I had middle school classes occasionally and enjoyed that, but high school was where I was the most comfortable. I stay at home with my kids now but some days I really miss teaching. One time a student told me "I saw you in Wal-Mart with your friends and you were laughing. It seemed really strange." Me: "The laugh?" Him: "No, that you have a life outside of school." Another student "you must have a life besides being a teacher because you're engaged!" During my first year of teaching, I was often at school until 8 or 9 so I think I got a reputation... Haha. No doubt you have been called to Middle School because for most of us, taking them to an island until they go to High School would be the way to go! : ) You are touching lives at a very important time frame for them and I am so thankful for you and other teachers like you who invest so much of themselves into these kids. I know the rewards outweigh the need for hazard pay most days. Keep it up, you matter! Thanks for sharing these insights into your classroom, I am amazed! I just had to post today because I literally laughed out loud at the hulk picture! That's a good one! 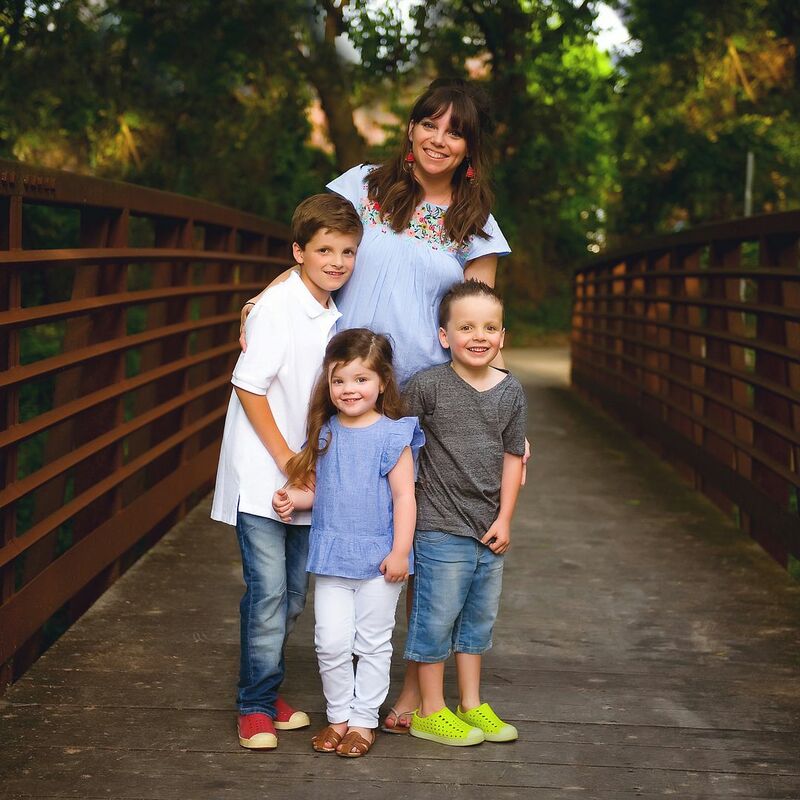 And as the mom of two middle schoolers . . . bless you! 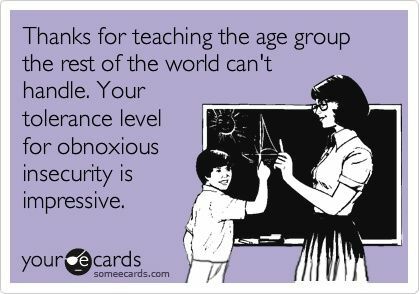 Great teachers make such a huge difference at that age! Have a great week! I teach Kindergarten and I had 2 students (a boy and girl) ask if they could have a sleepover at my house! I told them I didn't even toys or an extra bed for them and they said that they would watch tv and sleep on my couch. 😂😂 Being a teacher is the most exhausting, rewarding, and fun job! I wouldn't want to be anything else! Thank you for doing what you do and doing it so well! I am positive that when your students look back on their middle school years, time spent in your classroom will be a bright spot! Happy Tuesday, Andrea! Thank you for kind words about Middle Schoolers! I have one and I think she is pretty amazing, but it is great to hear a teacher think so too! Middle school years can be the best time for building friendships, independence and self-worth, if given the right love and nurturing. My Mom is a retired teacher and I always say, you have the most important job! You make me laugh with middle school comments!! I am living with a 6th grader so I get how weird, yet sweet they are!! Kudos to all teachers-you all deserve a BIG raise!!! Could you please just do a posting of the funny things your kids have said. I am laughing so hard over here!! Loved it!! Love this! I taught and coached 7th and 8th grade before having my little girl, and I absolutely want to go back one day. I miss those sweet, weird, awkward kiddos! I'm a Piano Teacher, so I teach all ages. You never know what a kid is going to say to you! One time I was explaining something to a student, and was really feeling like I was doing a great job of explaining it. I was having one of those moments like this is why I'm a Teacher, to show people the joy of music! I got done with my explanation, feeling pretty darn good about myself. My Student looks at me, tips her head to the left and says "Miss Charity?.... You have really small teeth!!" Then there was the time a student needed to use the restroom in the middle of his lesson. I was sitting by the piano waiting for his return when I hear him singing "Let it go" from the Restroom. Love this post! This made me laugh because just today I was talking about Saved by the Bell since its "nerd day" and some kids remind me of Screech! Some kids knew what I was talking about but others were clueless. Love my 8th graders! I teach 7th/8th grade Language Arts - I'm with you! I love my middle schoolers! I teach k-5 elementary music in North Iowa. My favorite story was a kindergarten boy repeatedly telling me he liked my "boops." I was MORTIFIED, kept asking him "what do you like?" and he finally said "YOUR BOOPS! They're just like mine!" and pointed to his cowboy BOOTS! I taught middle school for six years and will again once my littles are in school. I loved it too and also feel that I was where I was meant to be. It makes all the difference for you and for the students, so great to hear you feel that way! I teach college freshmen now, but I've taught everything from kindergarten to middle school, and I genuinely love it all. One of my kindergarteners once told me I reminded her of Winnie the Pooh (thanks, kid). One time a college student raised his hand to read aloud his conclusion, as we were working on literary analysis papers. He cleared his throat and read, 'in conclusion, Hamlet had a buttload of thoughts." LOL. #Truth. Love your blog. Especially your book club posts. Really fun! I teach high school and people always say the same thing to me. How do you do that? I love it but I would not enjoy teaching elementary at all. I love this post and your blog in general. Hahahaha .... You made me laugh so hard!! I teach preschool. We had a visit from the police one day. He shook his head and said "I just don't know how you can work with little kids" . I LOVED this post. I taught middle school for two years and high school (9th grade so it was close!) for one year before I had our oldest kid and stayed home seven years ago. I LOVED IT. They are crazy, CRAZY kids, but I loved that they were still not "too big" to need us. You're so right about it being the middle. They act all grown up and tough, but then they'll come by your room at lunch to talk just because. I loved to watch them trying to navigate their new, semi-independent world. I substitute teach for middle and high school. Middle school is my favorite because kids are independent, but still want to talk to you. The only time I'm nervous is when taking roll. Names can be rather unique and difficult to pronounce and I hate mispronouncing someone's name. I also sub in Alt Ed on occasion (kids that cause issues in the regular school environment, so they are put in a separate building). The stories I heard made me want to cry...kids that aren't really bad, but growing up with no love or guidance. Thankful there are teachers like you who love their job and the kids they teach. It's most definitely not for the faint of heart. I just read this article today. I literally laughed out loud! I teach 6th - 10th grade SPED. My students are so much like this! I am around so many 6th -12th graders in my school and there is constantly something going on. Teaching middle and high school aged students is the one thing I said I would never do, but I agree with you. There is something about these age students... I just love them all and at the same time want to pinch their heads off, lol! Thank you for writing such wonderful articles. I'm definitely going to share your blog with fellow teachers!